Ninnekah has a tradition of using basketball to fight cancer. Each year, one night of basketball is chosen to honor and remember those who have fought cancer. Ninnekah also uses these nights to raise money for cancer research organizations or for families in our community who have been affected by this disease. 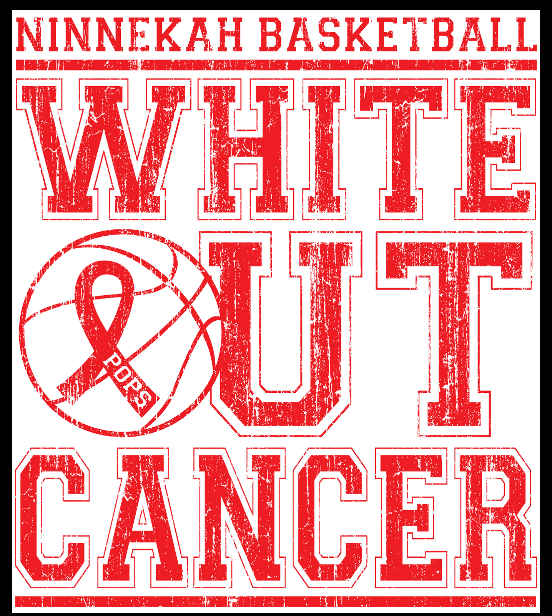 Thursday, December 15th, will be White Out Cancer night as Ninnekah takes on Maysville in basketball. Games will start with the JH at 4:30pm, followed by the HS games at 6:30pm. T-shirt orders must be turned in to the High School by Tuesday, December 6th. Download T-Shirt Order Form here. T-shirts are being sold for $10 for most sizes. Ribbon Flyers will be displayed at the basketball games in honor, or in memory, of those who have fought cancer or are fighting cancer now. You can purchase one of these 8 1/2 x 11 inch flyers with your name or your loved ones name for $1 each. Download Ribbon Flyer Order Form here. Flyer orders need to be returned to the High School by Wednesday, December 14th. Additional blank ribbon flyers will be available for purchase at the game as well.